A Slice of Brie readers! This past weekend, we took Sully on his very first camping trip. We packed up our car, headed south a few hours and pitched our tent for two nights. We hadn't been camping in a few years and bringing a toddler along with you is a complete game changer. On our camping trips of the past, we pretty much just winged it when it came to food. Surviving on hot dogs, s'mores and beer is all fine when you're young and don't really care about how you feel when you wake up in the morning. Going into this camping trip though, I knew we needed a plan when it came to what food to pack. 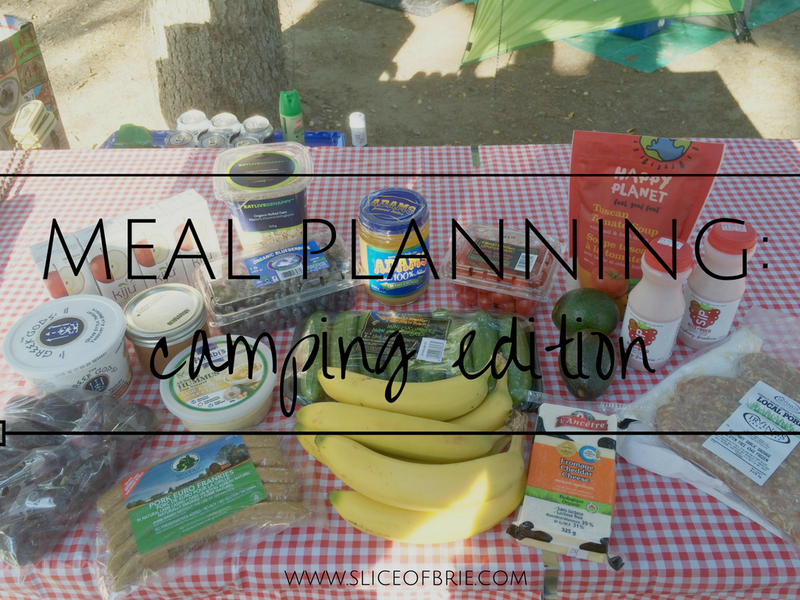 I'm a big fan of meal planning, so it made sense that I would plan out 3 days of camping meals, including snacks. In doing so, I wanted to avoid 3 things: packing too much food, not packing enough food and making a bunch of last minute grocery store runs. As a mom and a pregnant mom at that, it was important to me that I had healthy meals and snacks to balance out the chips and s'mores! I also didn't want to feel sluggish during the day or have any reason for my sensitive stomach to get upset. Enter SPUD! Utilizing their home delivery for fresh produce and groceries, I placed an order with them to have my Spud Box delivered two days before we left (delivery is free two days of the week in most areas!). I chose an arrangement of sausages, fresh fruit, yogurt, organic oats, soup, hummus, and organic cheese. Combined with ingredients already found in my pantry and fridge, the only thing we had to stop for on the way out of town was a small pint of milk. I made sure to keep our meals and snacks easy, tasty and appealing to both my husband and my toddler. I'm not saying camping shouldn't be fun and you shouldn't splurge on some junk, but a little bit of balance never hurt anyone! We still enjoyed our fair share of s'mores, beer (for the husband) and chips (my guilty pleasure!). Organic Rolled Oats cooked over the camp stove with Sultana Raisins, Cinnamon and Fresh Berries. Written out, it feels like a lot of food, but it fed us perfectly for our trip, which was technically, two breakfasts, three lunches, two dinners, plus snacks. The key is figuring out how much of everything to bring because it's not like when you are at home and you can easily store left overs in your fridge. This is where knowing your family and their appetites comes in handy. (I'm still trying to figure this out about my toddler though!). Luckily, fruits and vegetables do well in a cooler and while I may have brought more than we got through, I didn't have to throw anything out before heading home. I don't think we will venturing out on any more camping trips this year (stay tuned for a full recap post of this trip next week), but I'm already looking forward to next year and meal planning for those! It was fun to pre-plan out our meals and let me tell you, the stress of arriving at our campsite and not having to figure out what to eat despite a cooler full of food, was so nice! Do you meal-plan for camping or just "wing it"? What's your favourite camping meal? Have you ever used a grocery delivery service before?